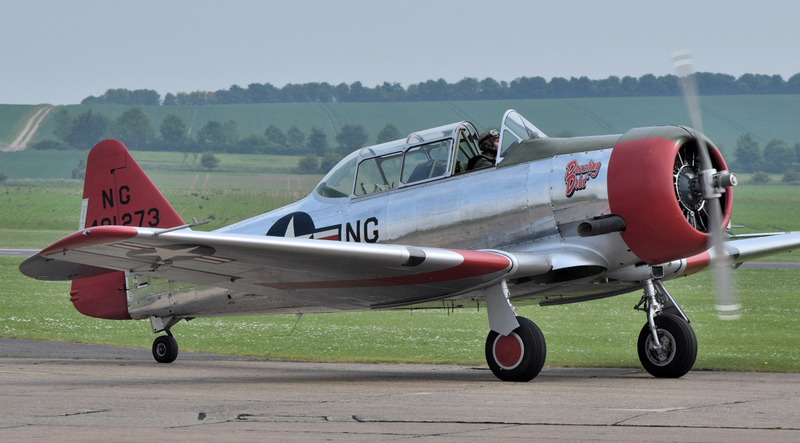 The 'Duxford Air Festival' took place over the May Spring Bank Holiday weekend of the 26th - 27th May 2018. 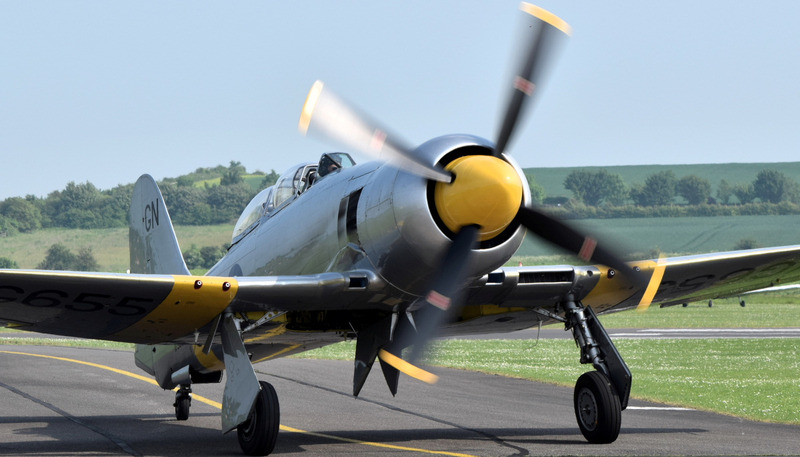 The 'Duxford Air Festival' is a ticket-only event and a £5 vehicle parking permit was also required for car parking which could be purchased when booking tickets. 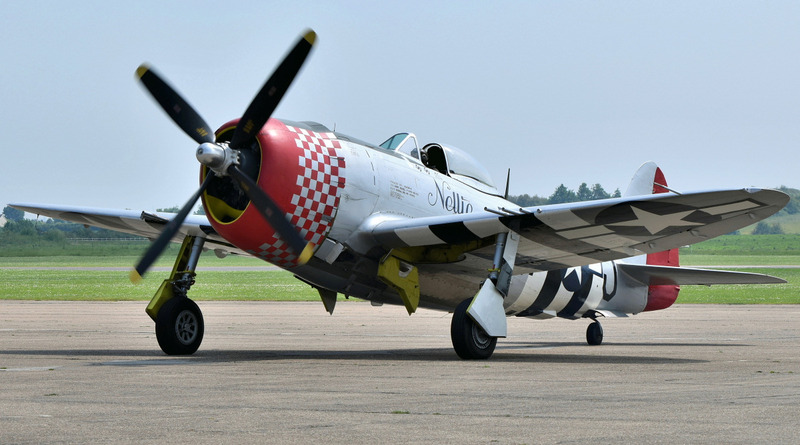 The very impressive museum is free to look around on air show days and there is plenty of time to view the extensive aircraft and exhibits before the air display starts in the afternoon. As well as the museum, there are plenty of stalls and ground entertainment to keep the family entertained. 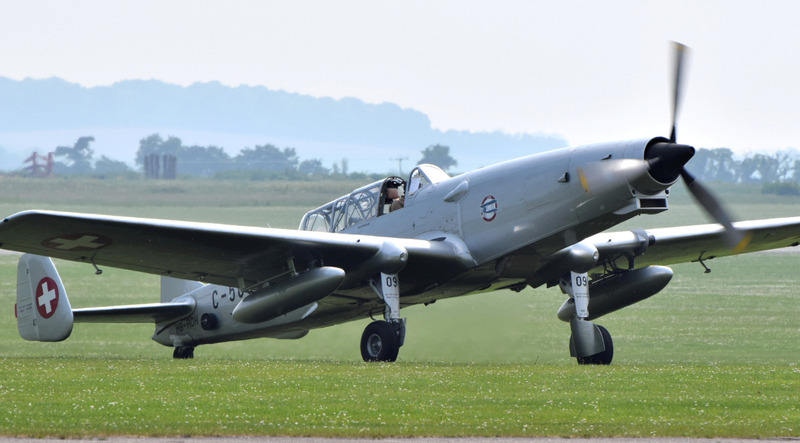 A flightline walk is available for an extra £6, where you can get closer to the static aircraft and photograph them. 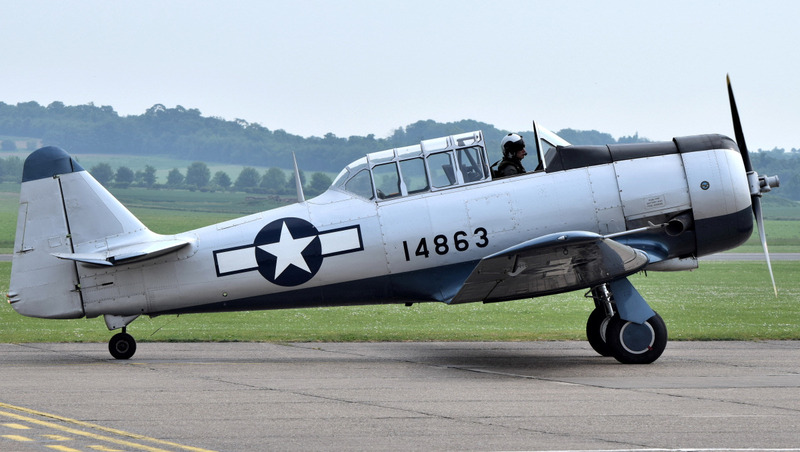 There are re-enactors alongside the aircraft which help bring Duxford's wartime atmosphere vividly to life. 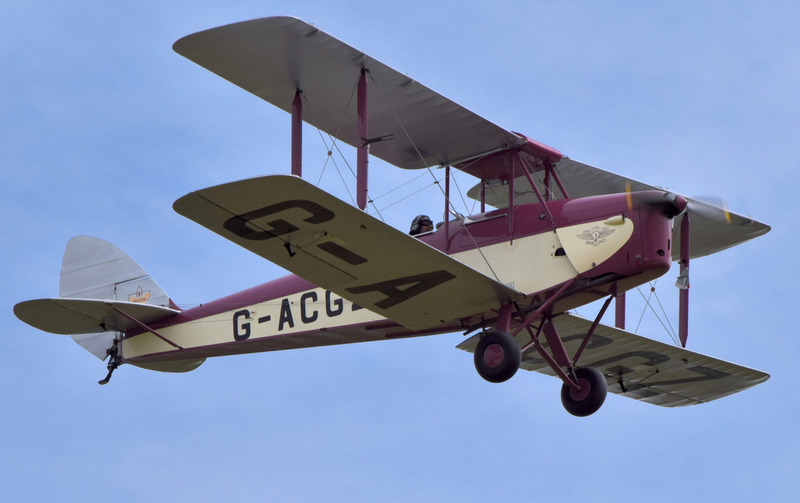 Before the display you can also take a flight in a DH Dragon Rapide, courtesy of 'Classic Wings'. The layout of the crowdline, following new safety measures, was the same as last year, where the crowdline was moved forward in the central area of the museum site, and the Land Warfare end of the site was closed off during the air show weekend. 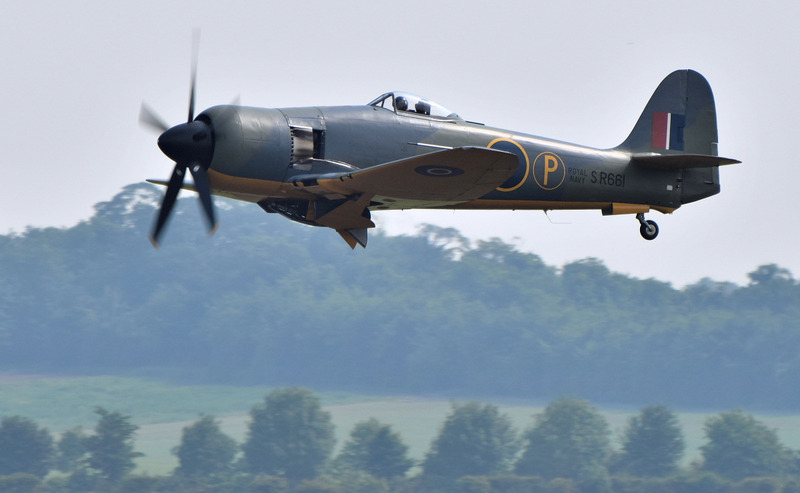 New for this year was a Grandstand, with a tiered seating enclosure, which was especially created to provide photographers, enthusiasts and aircraft fans with an uninterrupted view of the flying display. A ticket for the grandstand could be bought online and cost £15. The air display started at around 1pm and finished at about 5.40pm, on each day. 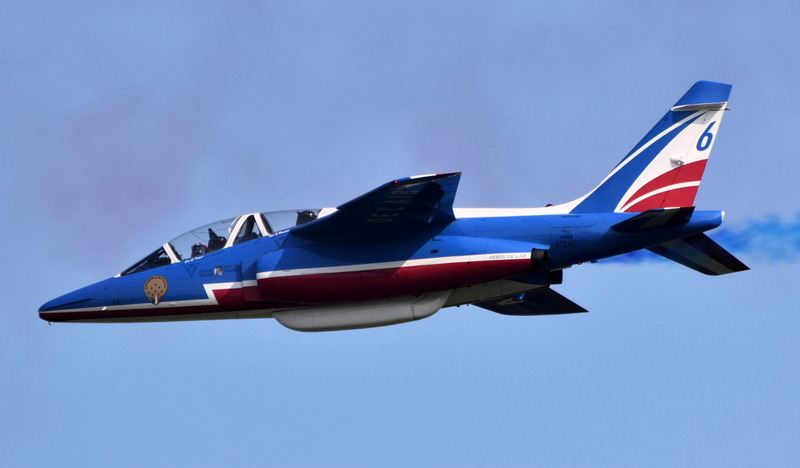 The French Air Force brought along their impressive Rafale C as well as the Equipe de Voltige team and Sunday also saw the Patrouille de France. 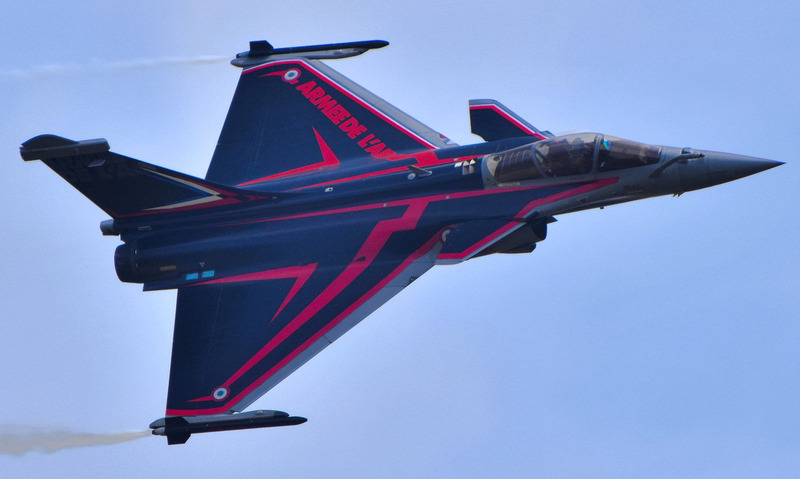 The Rafale C also displayed at last year's Air Festival and it was a welcome sight again this year, especially as it was painted in a new striking colour scheme. 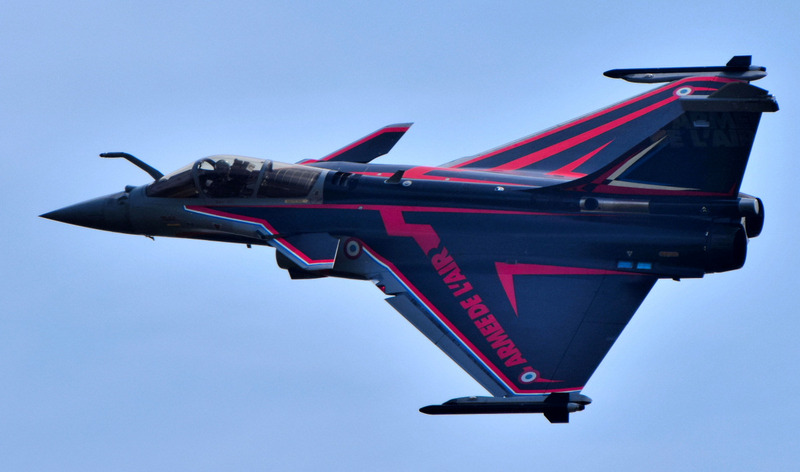 The Rafale is a French twin-engine, canard delta wing, multirole fighter aircraft, designed and built by Dassault Aviation. 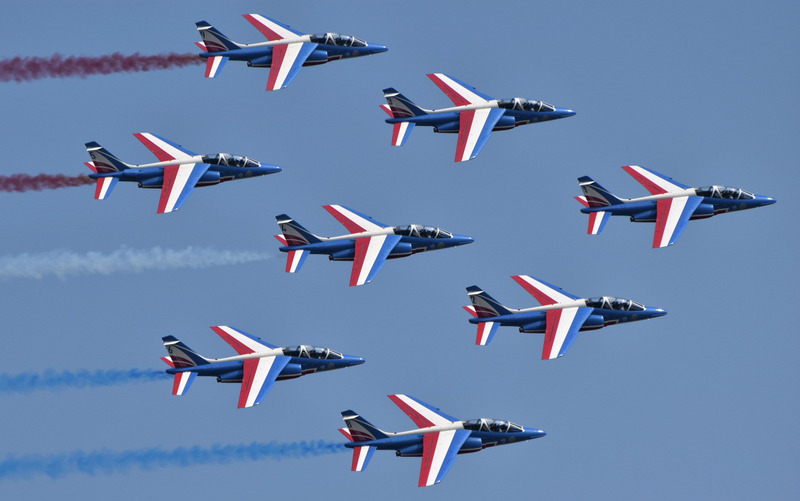 It was introduced in May 2001 for both the French Air Force and for carrier-based operations in the French Navy. The Rafale has three main variants: Rafale C (single seat, land based version), Rafale B (twin-seat land-based version) and Rafale M (single-seat, carrier based version). 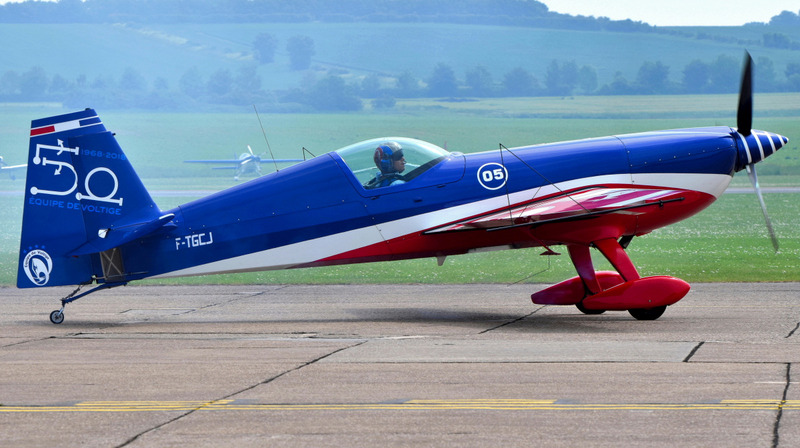 The French Air Force's Equipe de Voltige aerobatics team made their debut at Duxford, as they celebrate their 50th anniversary. 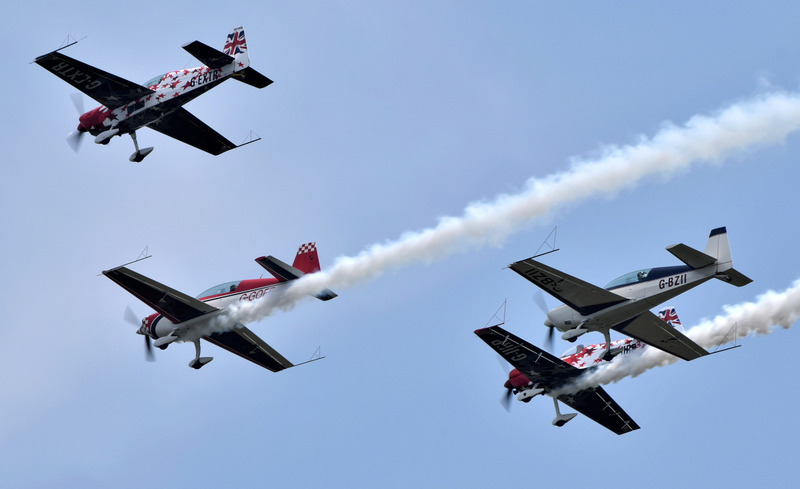 They usually fly with two Extra 330SC aerobatic aircraft in close formation, but flew with just one aircraft at Duxford. 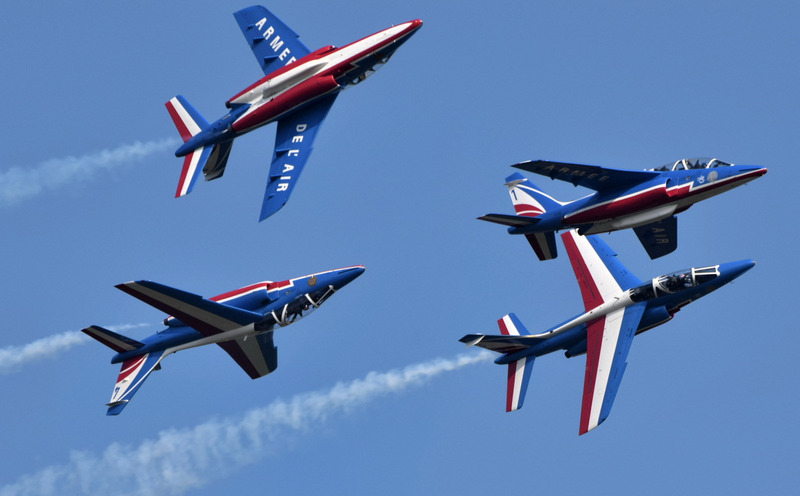 The team is directly connected to the Ecole de L'Air (the French Air School) which offers first-class training to pilots and mechanics. 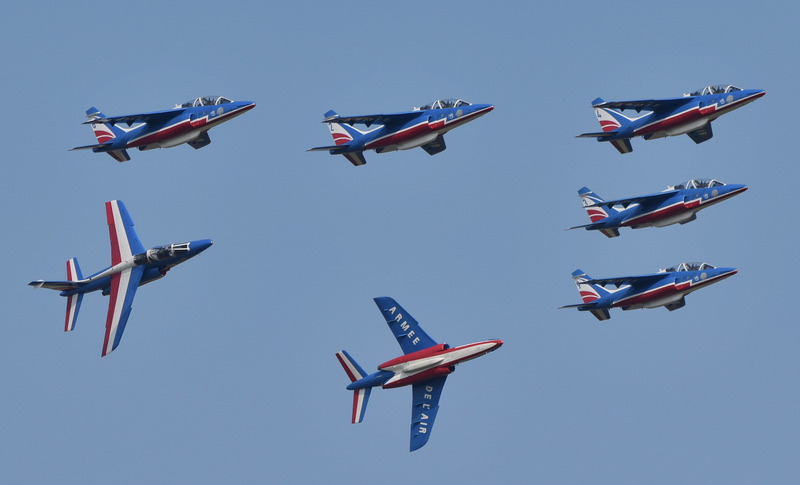 The Patrouille de France displayed on Sunday, along to music, with their eight Dassault-Breguet/Dornier Alpha jet aircraft and were probably the highlight of the show along with the Rafale. 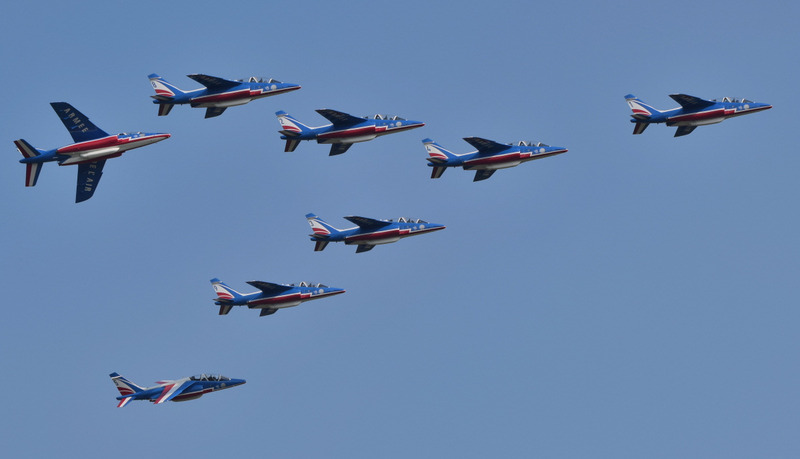 The Patrouille de France are based at Salon-de-Provence Air Base in southern France and are one of the oldest display teams, as they were officially formed in 1953, flying the Republic F84G Thunderjet. On Saturday the Royal Air Force displayed their Chinook helicopter. For such a large and heavy helicopter it is able to put on a very manoeuvrable and impressive display. The RAF Chinook is based at RAF Odiham in Hampshire which is home to three squadrons of these aircraft (7 Sqn, 18 Sqn & 27 Sqn). The Chinook is mainly used for transporting troops, resupply and battlefield casualty evacuation (casevac) and can be operated from land bases or from seaborne vessels. 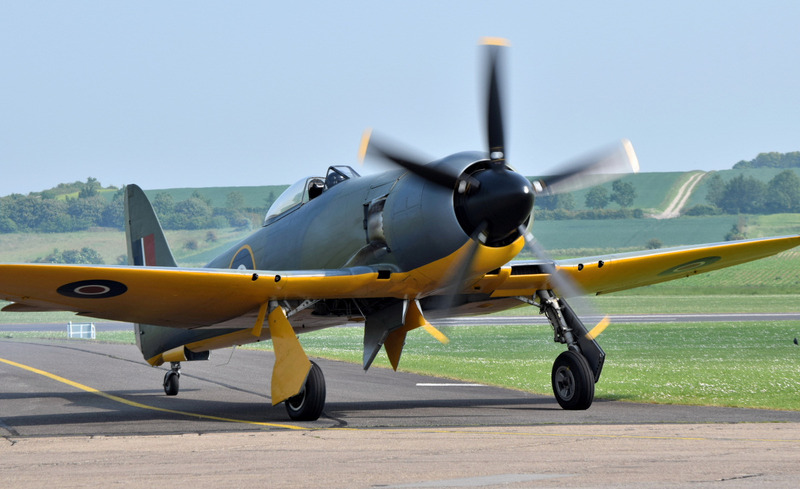 The Fighter Collection (TFC), based at Duxford, displayed their Goodyear FG-1D Corsair (G-FGID), Noorduyn Mk.IIb Harvard (G-BTXI) and Hawker Sea Fury T-20 (G-CHFP). 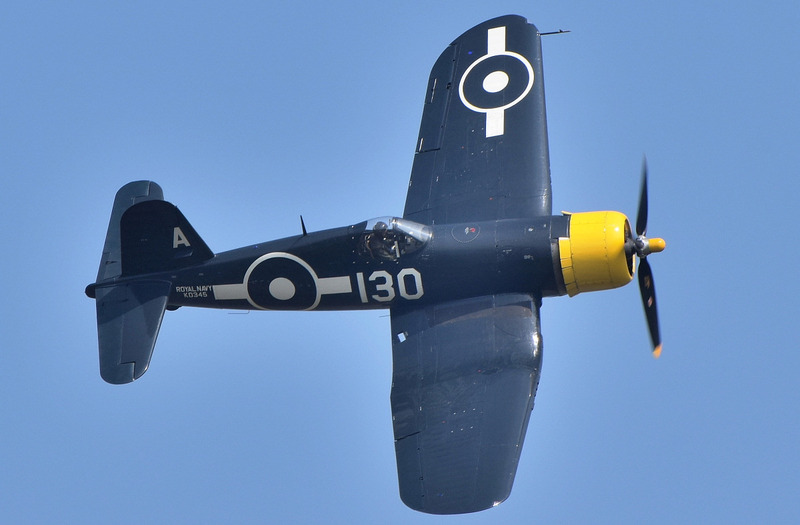 The Goodyear FG-1D Corsair (G-FGID) is painted in the colours of a British Fleet Air Arm machine, KD345 of 1850 Squadron during December 1945, when they were embarked on HMS Vengeance of the British Pacific Fleet. It is also one of the few still flying with fabric wings. 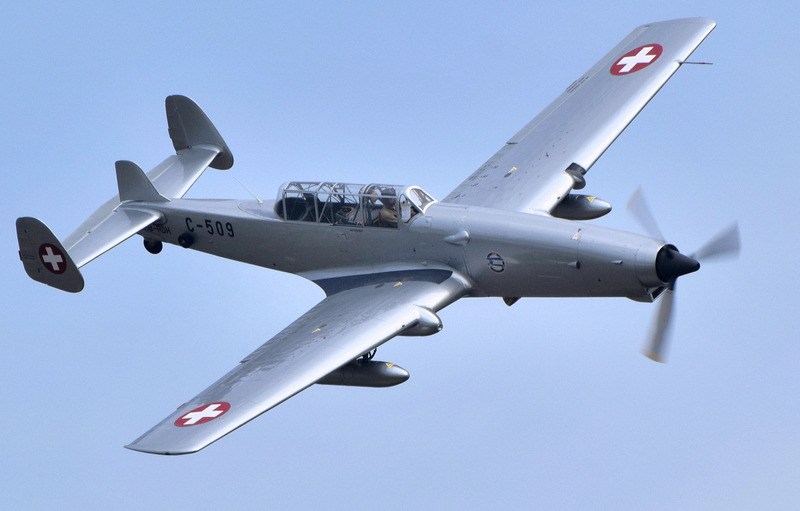 The Noorduyn Mk.IIb Harvard (G-BTXI) joined The Fighter Collection in 1990 and after restoration returned to flight in May 1996. 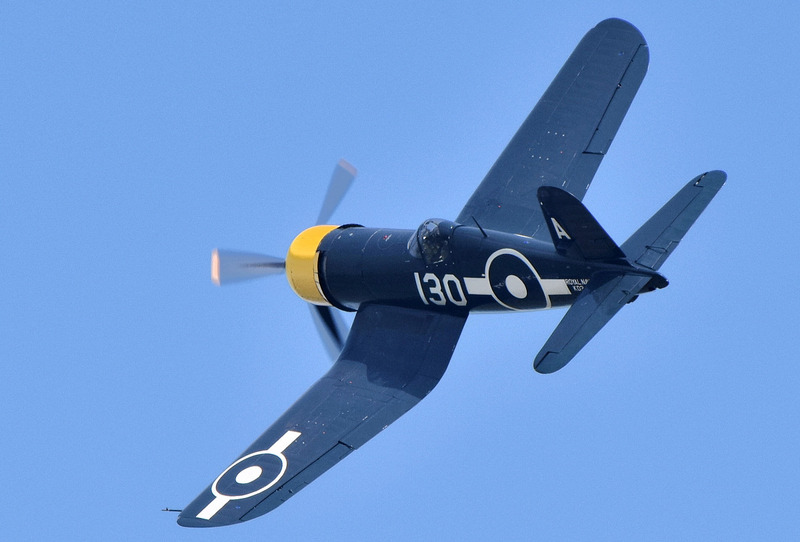 This particular aircraft had served as an advanced trainer with the Swedish Air Force from 1948 to 1972. 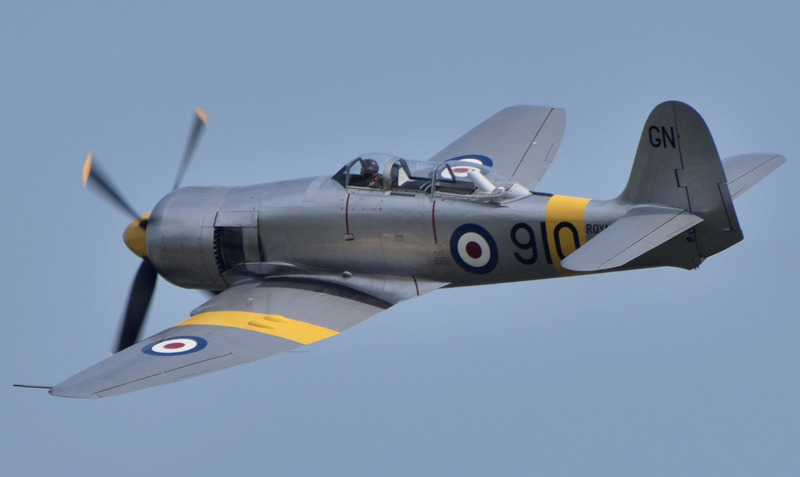 The Fighter Collection's Hawker Sea Fury T-20 (G-CHFP) was joined by Air Leasing's Hawker Fury FB11 (G-CBEL) in the air display. 'Navy Wings' also displayed their Hawker Sea Fury T-20 (G-RNHF). 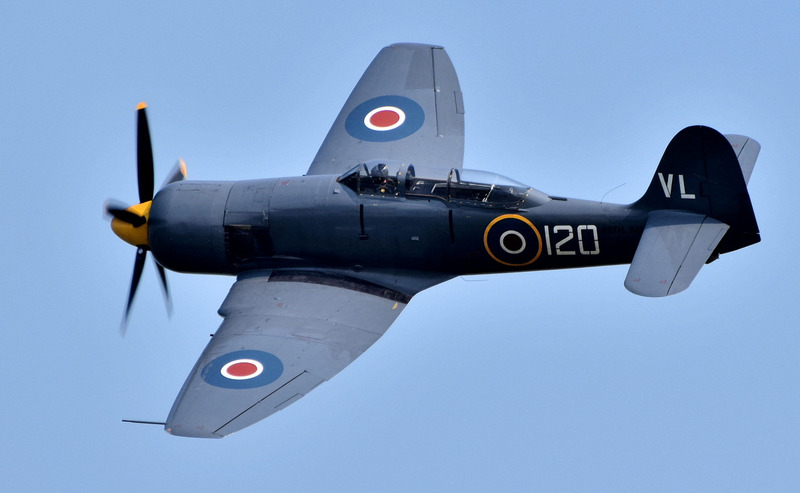 The 'Navy Wings' Collection unites a range of owners and operators of historic Naval aircraft with many of the aircraft from the Royal Navy Historic Flight (RNHF) and the Fly Navy Heritage Trust (FNHT). 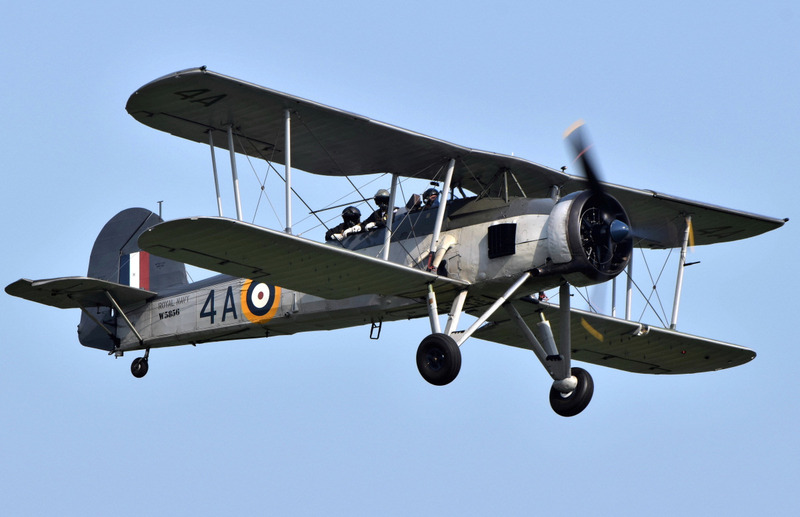 The 'Navy Wings' Fairey Swordfish Mk I was also a welcome sight in the air display at the Duxford Air Festival. 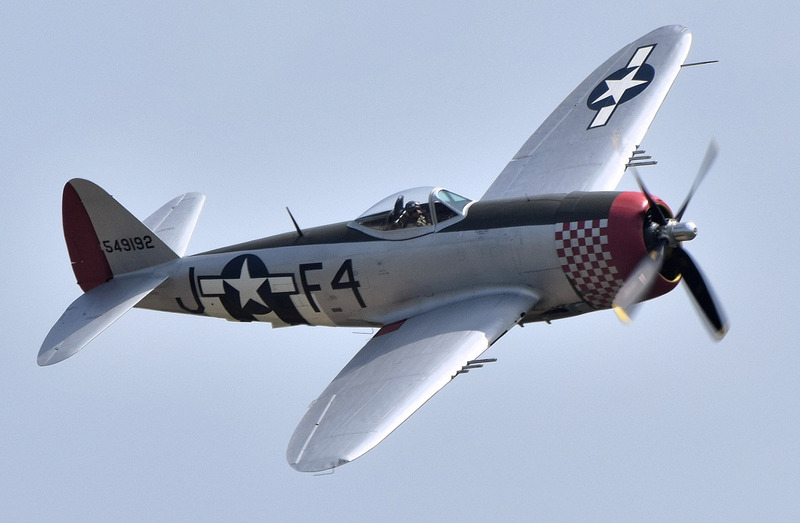 Another welcome addition to the air display was the Republic P-47D Thunderbolt 'Nellie' (G-THUN). 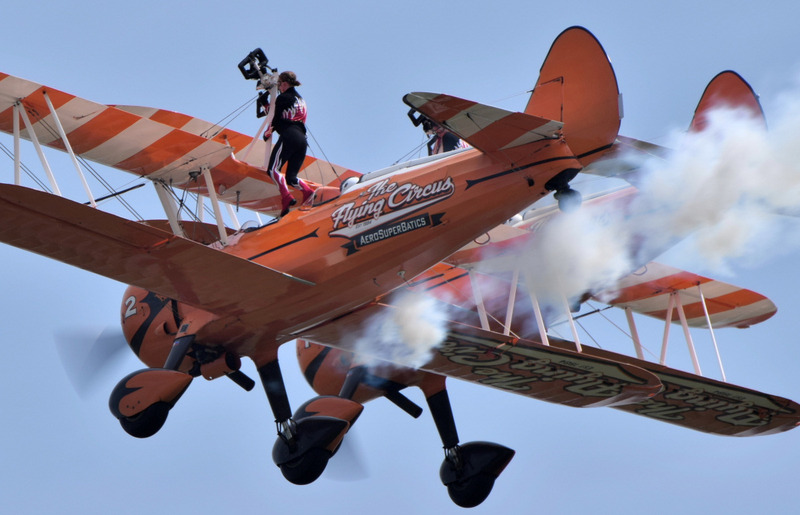 This aircraft was a regular performer at UK air shows and was known as 'No Guts - No Glory' until it was sold and moved to the USA in 2007. 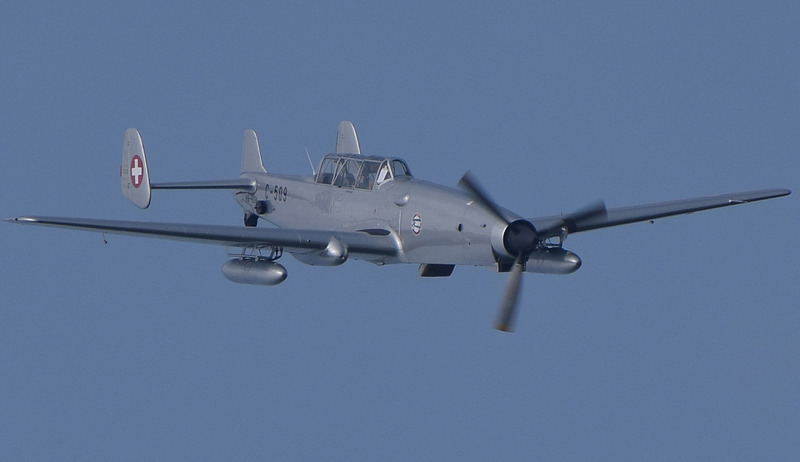 This aircraft has recently been bought by 'Fighter Aviation Engineering LTD' and shipped back to the UK in 2018. 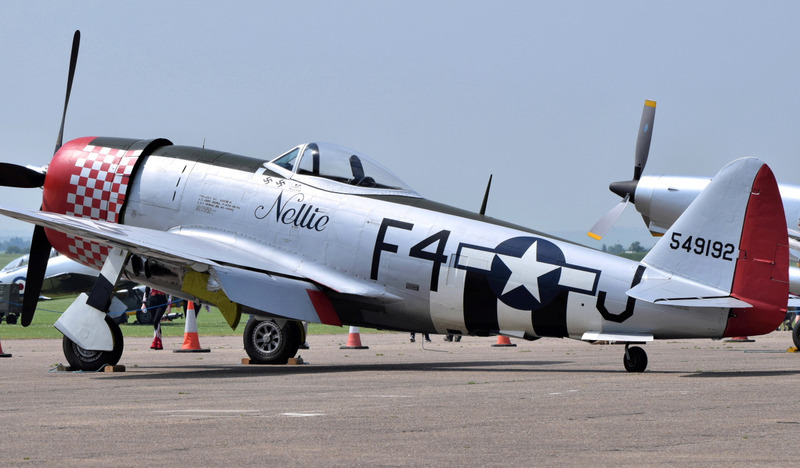 It has been given a new paint scheme representing F4-J Nellie of the 492nd Fighter Squadron, 48th Fighter Group, 9th Air Force and flew in the UK again on the 4th May 2018. 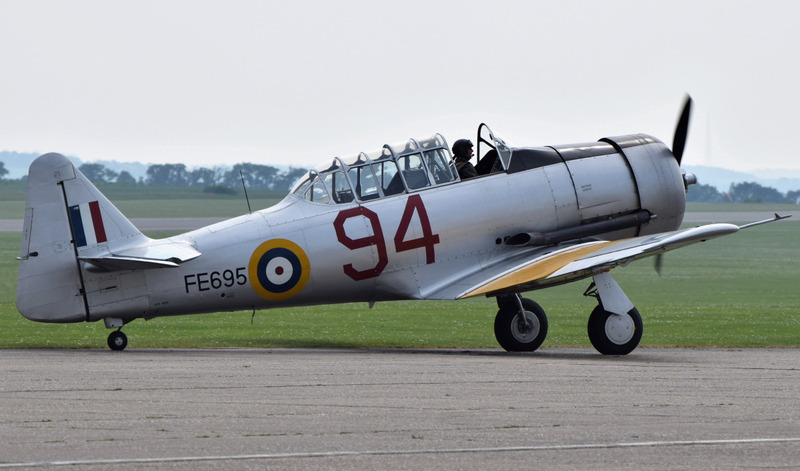 As well as the Fighter Collection's Noorduyn Mk.IIb Harvard, there were no fewer than seven North American T-6 Harvards in the flying display. 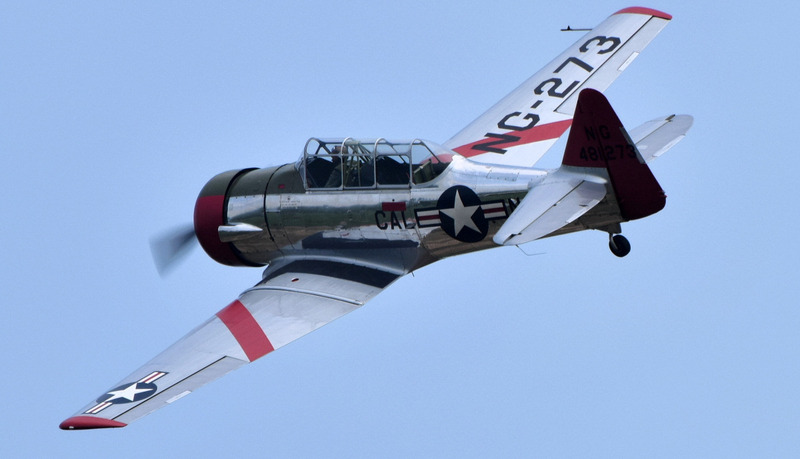 These American aircraft were used as single-engine advanced trainers during World War II right up to the 1970s. 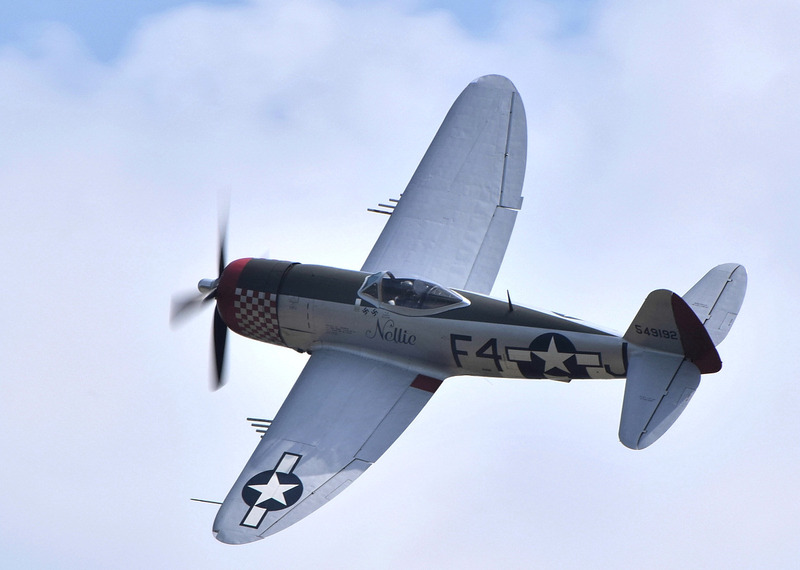 Over 15,000 of these aircraft were built and operated with many countries around the world. 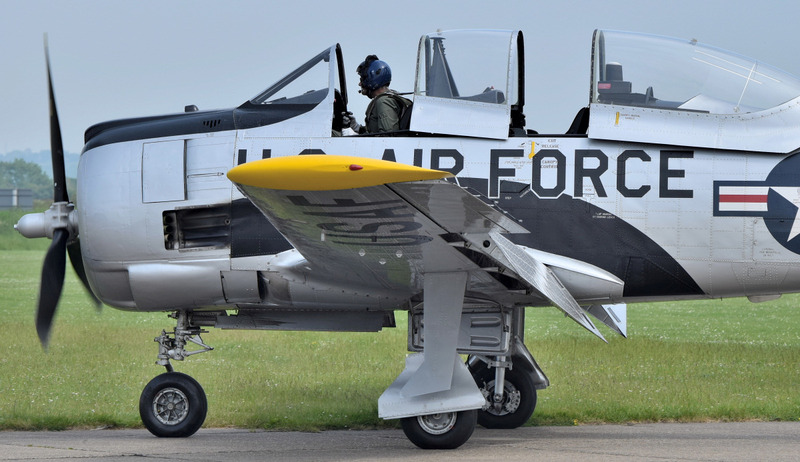 The North American T-28 Trojan/Fennec was another piston-engined military trainer aircraft that took part in the flying display, although on Sunday it had to cut short its display due to a problem. 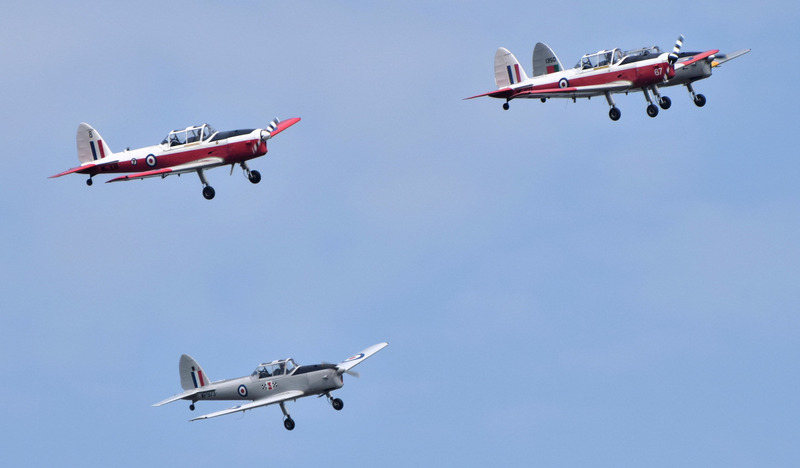 Four de Havilland Canada DHC-1 Chipmunk displayed in formation at the Duxford Air Festival. 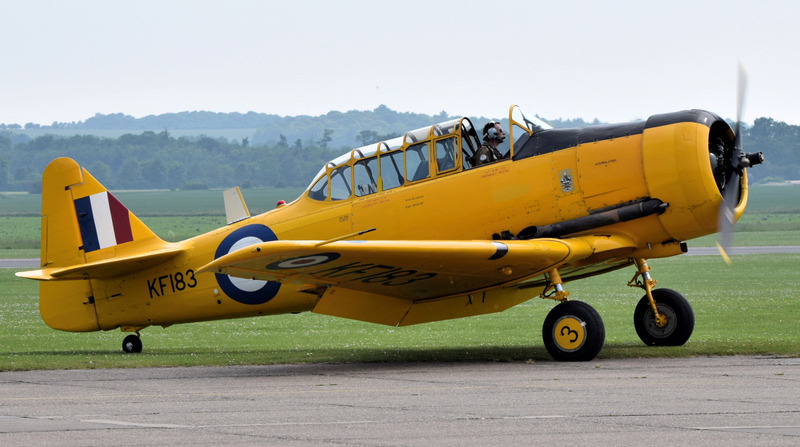 The DHC-1 Chipmunk was a tandem, two-seat, single-engine primary trainer which was developed and manufactured by de Havilland Canada. 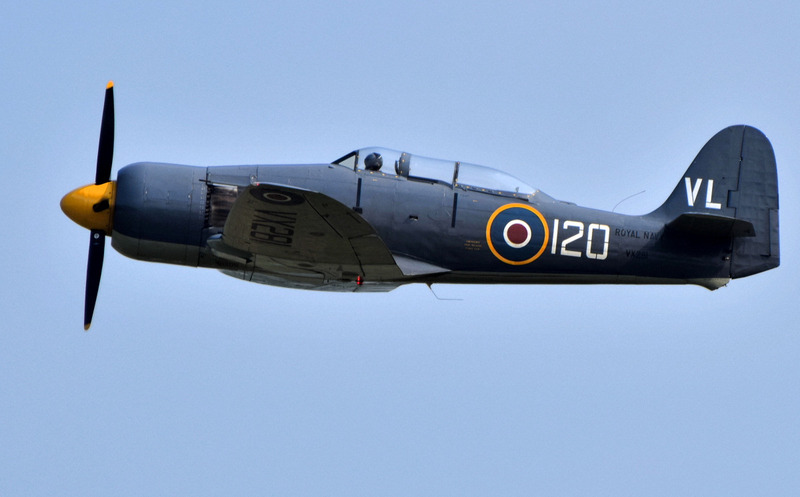 Canada, Britain and Portugal produced 1,284 of these aircraft from 1947 to 1956. 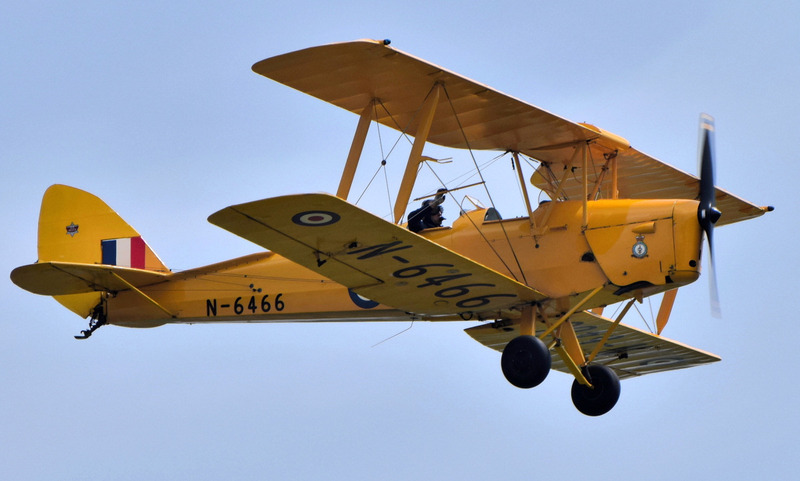 These aircraft typically replaced the de Havilland Tiger Moth as the primary trainer. 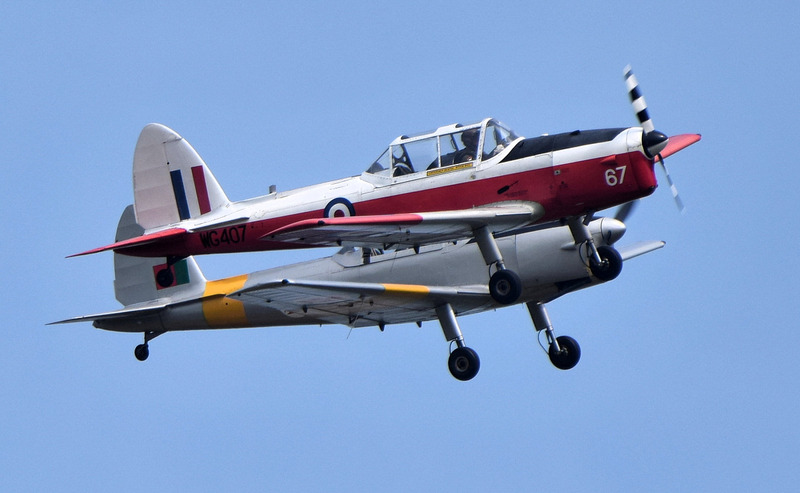 In the UK, Chipmunks remained in service with the Air Training Corps (ATC) until 1996, when they were replaced by the Scottish Aviation Bulldog. Also displaying at the show was the B-17G Flying Fortress 'Sally B' (G-BEDF), Plane Sailing's Consolidated PBY-5A Catalina 'Miss Pick Up' (G-PBYA, 44-33915), a Douglas C-47 Skytrain (Percival Aviation) and the Imperial War Museum's Supermarine Spitfire Mk.Ia (N3200). 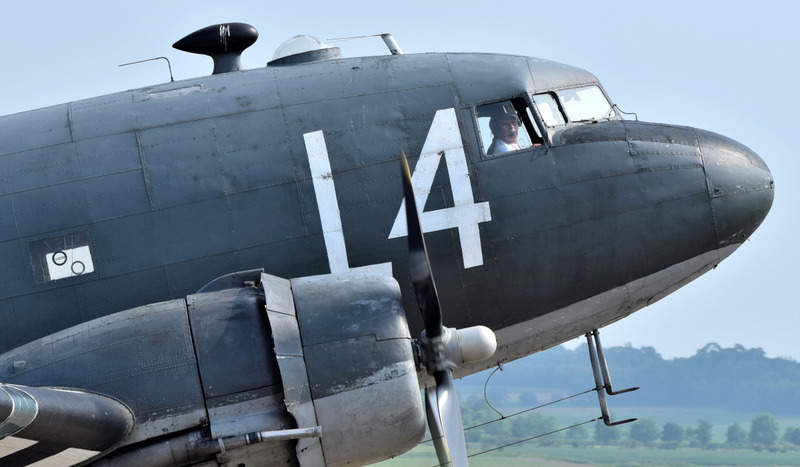 Sally B is a regular performer at Duxford, where she is based, and is operated by Elly Sallingboe of 'B-17 Preservation' with the help of a dedicated team of volunteers and the backing of one of the largest supporters clubs of its kind in the world. 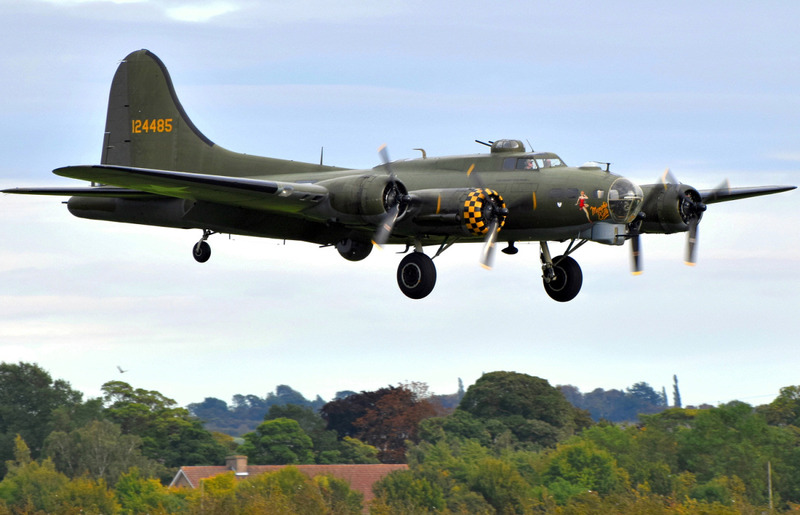 This is the last remaining airworthy B-17 Flying Fortress left in Europe and is a memorial to the United States Army Air Force (USAAF) in Europe. The Boeing B-17 Flying Fortress was a four-engine heavy bomber, developed for the United States Army Air Corps (USAAC), which became the USAAF in June 1941. B-17s were based in Britain and used as daylight strategic bombers, during World War II, against German industrial and military targets. To help keep this aircraft flying then please check out the 'Sally B Supporters Club'. 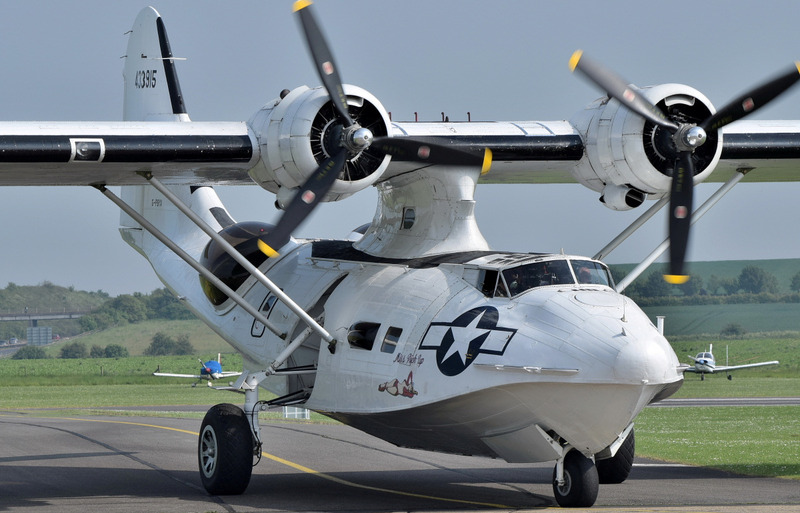 The Consolidated PBY-5A Catalina is also based at Duxford and is operated by 'Plane Sailing Air Displays Limited' which is made up of a number of shareholders. They have their own 'fan club' called 'The Catalina Society'. The Catalina was a maritime patrol bomber and search & rescue seaplane. It was ideally suited to hunting German U-boats in the Atlantic during the second world war, due to its long range and armament. 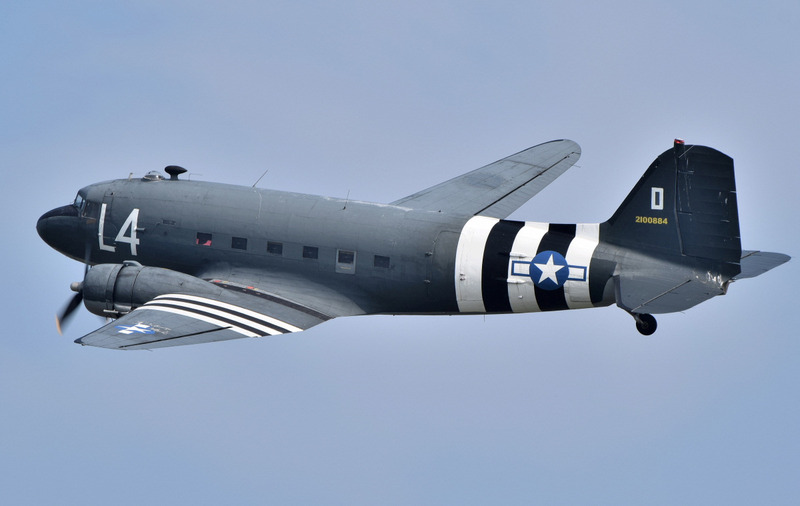 'Aces High' displayed their Douglas C-47A Skytrain. 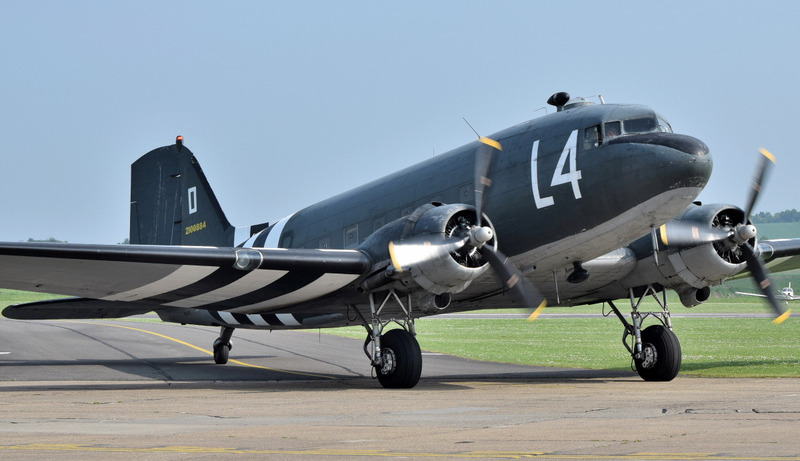 This aircraft type was developed from the civilian DC-3 Airliner and called the 'Dakota' in RAF service. 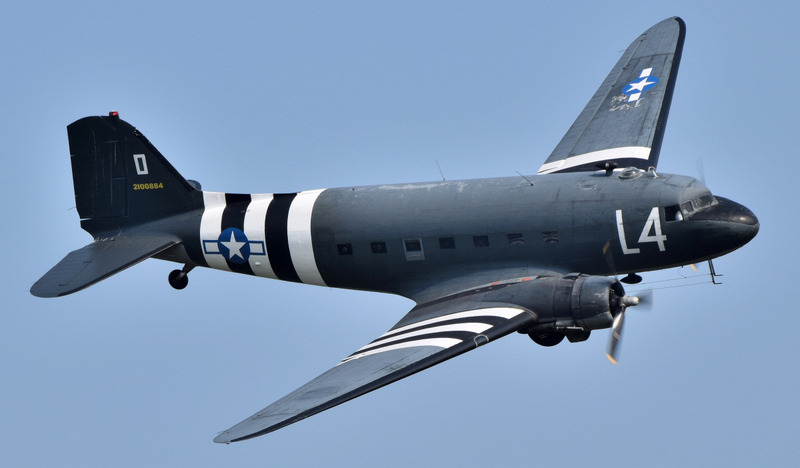 Built in vast numbers from December 1941, it was used as a military transport aircraft as well as to drop paratroops and tow gliders during the second world war. 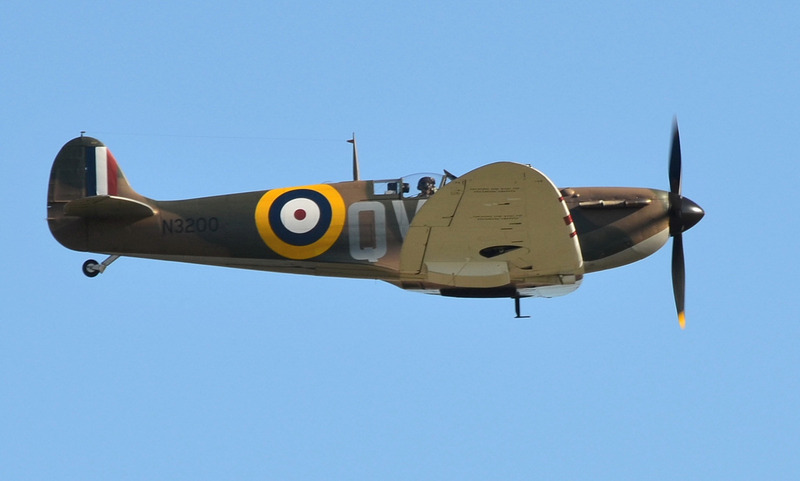 It was great to see a Spitfire display at the Duxford Air Festival considering Duxford was home to the first operational Spitfire squadron (19 Squadron). 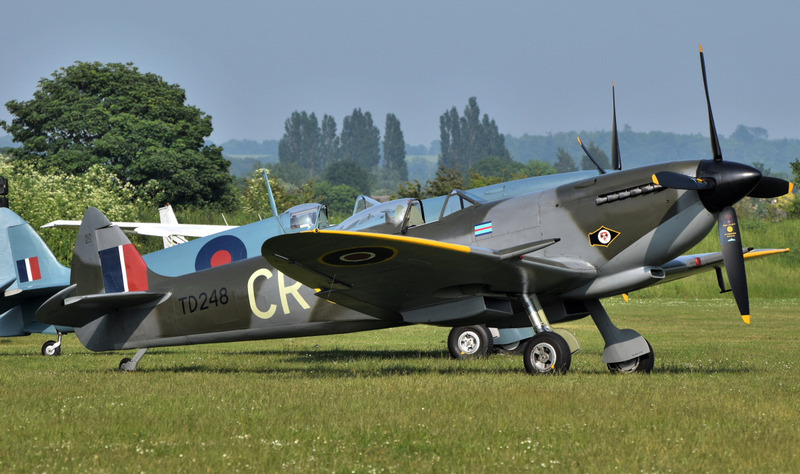 This particular Spitfire is a mark Ia and is owned by the 'Imperial War Museum' at Duxford. This Spitfire was donated to the Imperial War Museum on 9th July 2015 by American billionaire and conservationist Thomas Kaplan (aka Mark One Partnership LLC) and accepted on behalf of the museum by its Patron, Prince William (Duke of Cambridge). 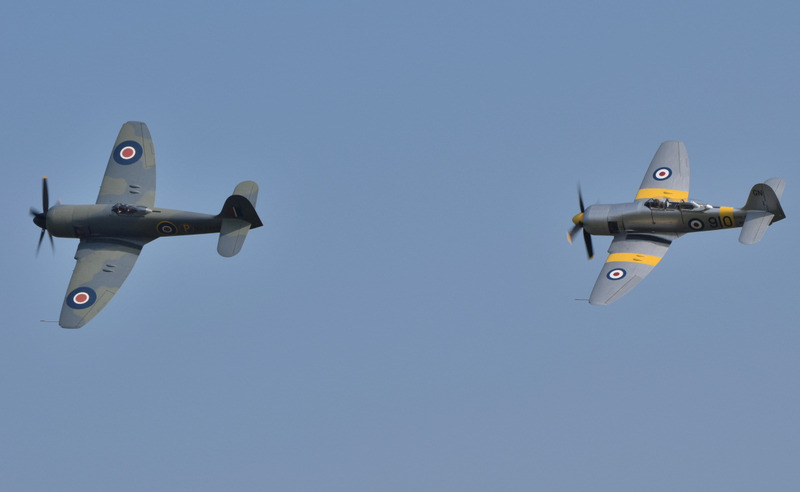 Although not part of the air display, there were two Spitfires on static display which took-off on Sunday morning for a short flight before returning. 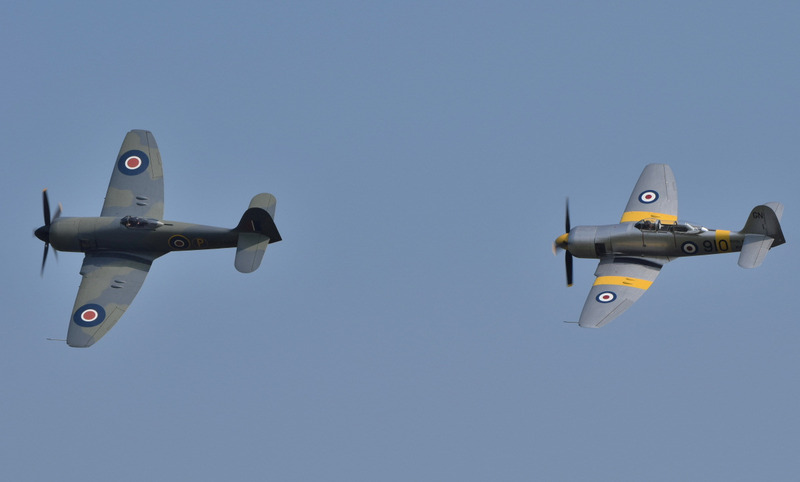 These were Spitfire Mk.XVIe (TD248) and the newly restored Spitfire PR.XI (PL983). 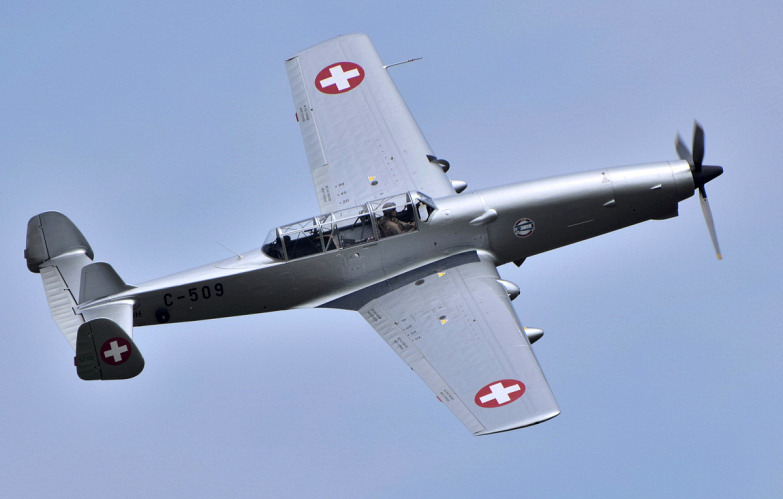 Also displaying was the unusual looking Farner Werke (F+W) Schlepp C-3605 (C-509, HB-RDH) which is owned by '46 Aviation' and based at Sion Airport in Switzerland. 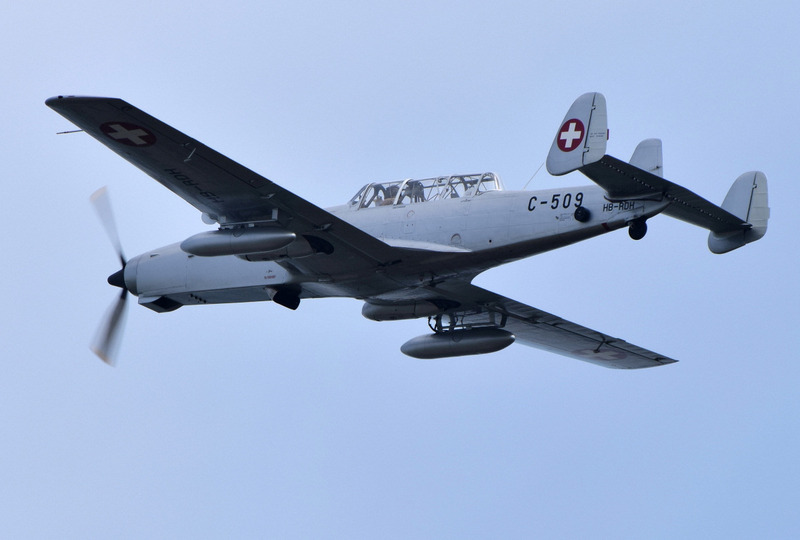 The Schlepp (Tug) was a target towing aircraft operated by the Swiss Air Force from 1971 to 1987. 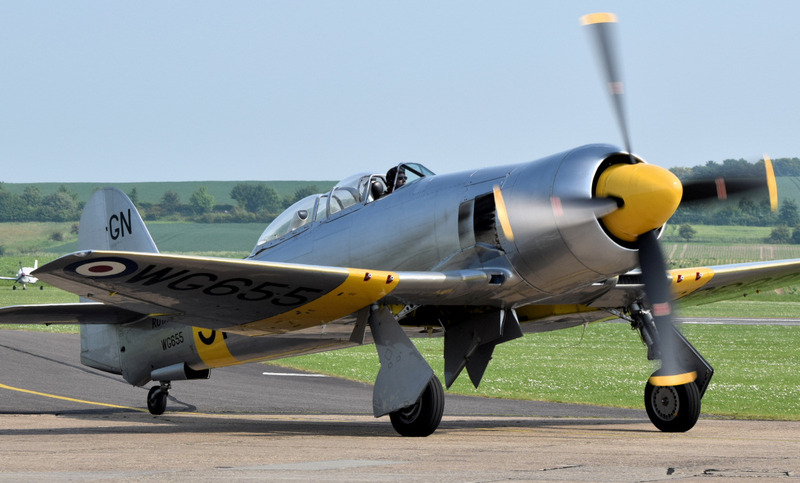 This particular aircraft is one of only two C-3605 aircraft in flying condition today. It is surprisingly agile for its size and very stable in flight at low or high speed. 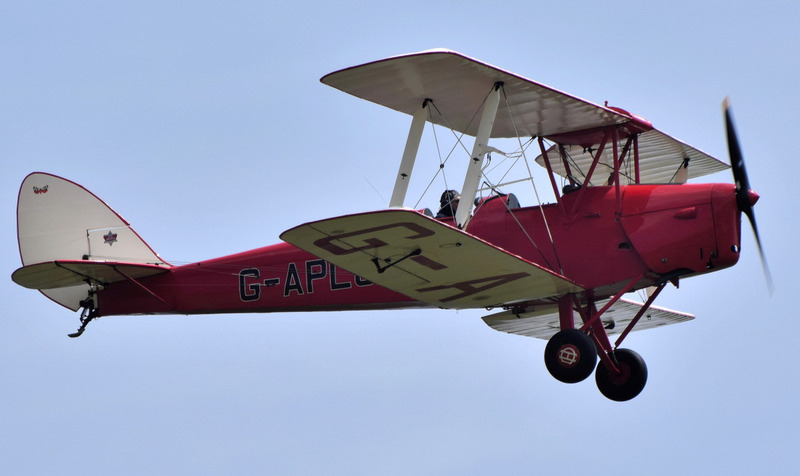 The show also included a number of civilian display teams including the AeroSuperBatics WingWalkers, TRIG Aerobatic Team, Tiger 9 Formation Team, Great War Display Team and Global Stars Team. 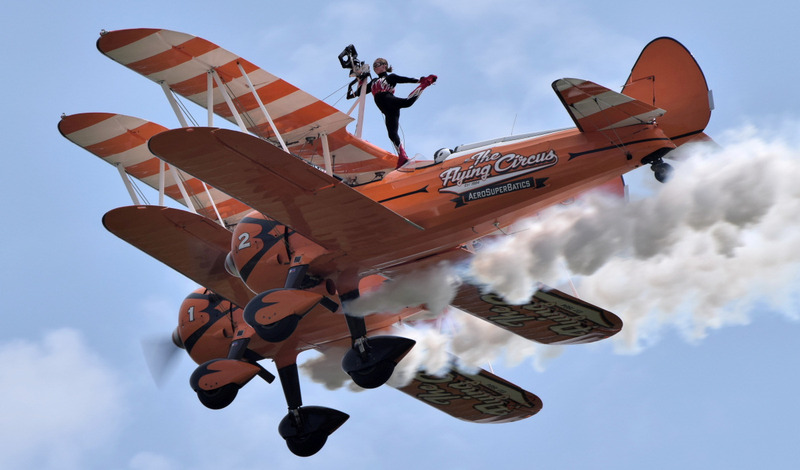 The AeroSuperBatics WingWalkers displayed with two Boeing Stearman biplanes complete with two daredevil girls on the wings. The team's seven-year deal with watch-maker Breitling has now come to an end and they are now looking for a new sponsor. 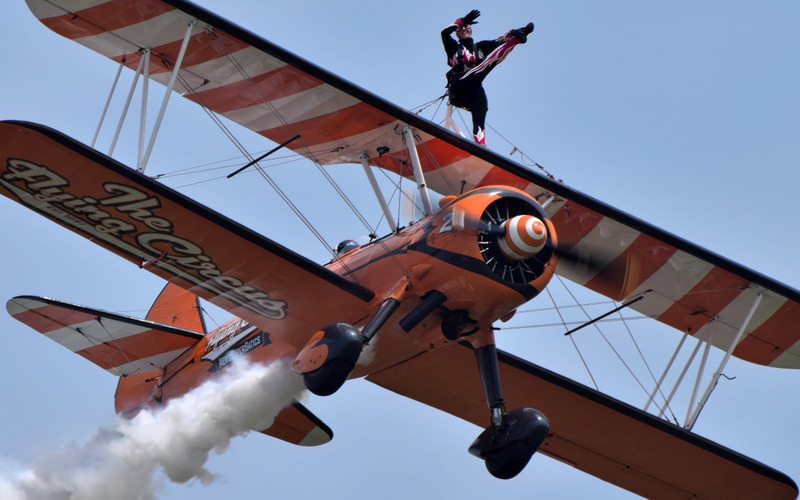 The wingwalkers perform a breathtaking sequence of acrobatic manoeuvres and handstands whilst strapped to the top wings, while the aircraft perform loops, rolls, stall turns and even inverted flight. 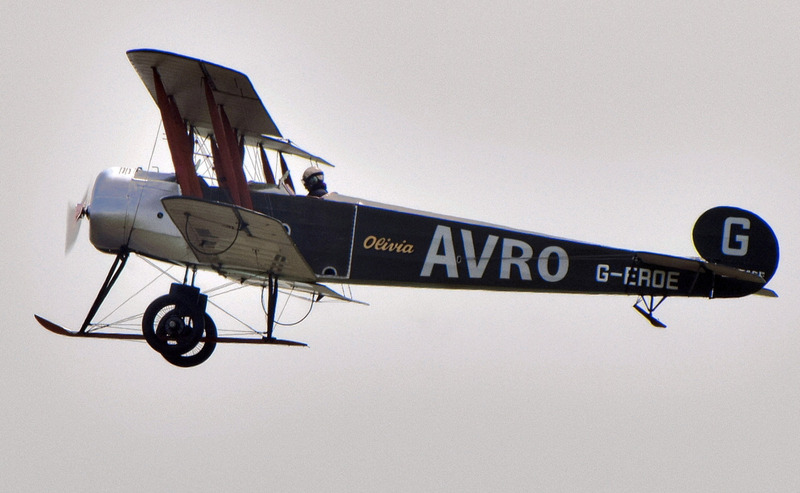 The team is based at Rendcomb aerodrome in Gloucestershire, which is one of the few WW1 aerodromes still operational. 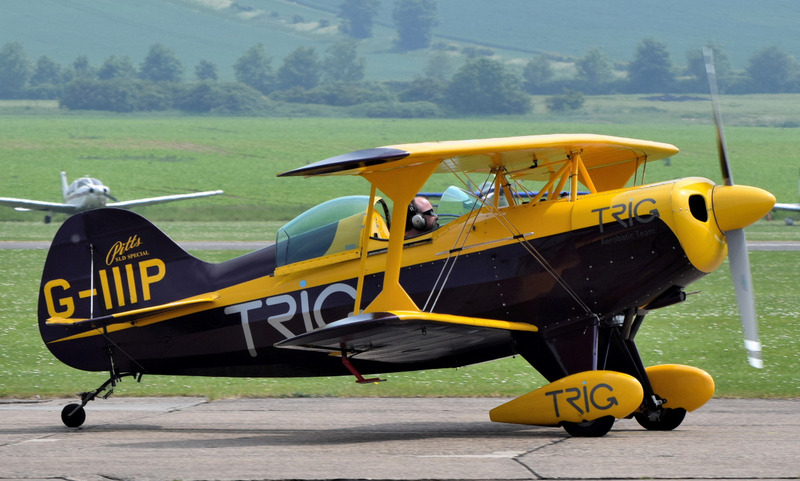 The TRIG Aerobatic Team operate two bright yellow Pitts Special S-1D biplanes. 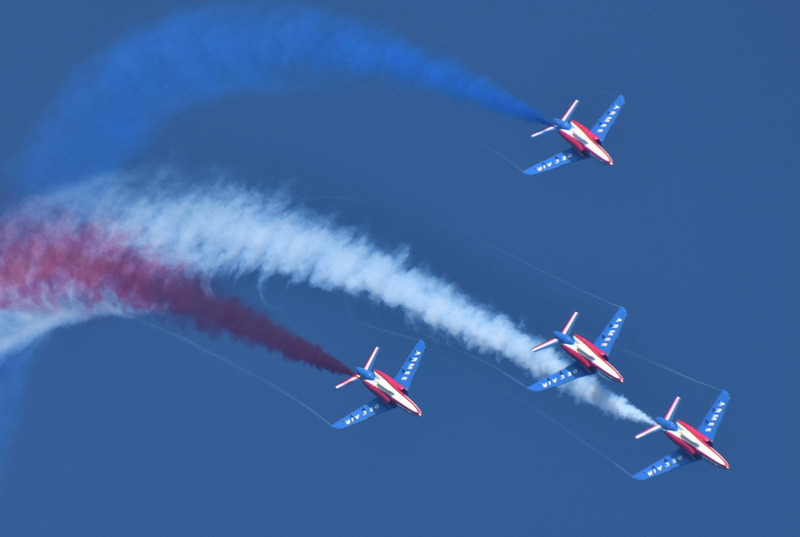 The team is known for their extreme close formation flying, their aircraft often flying only 5 feet apart and gravitational or 'g forces' of +6g and -4g. 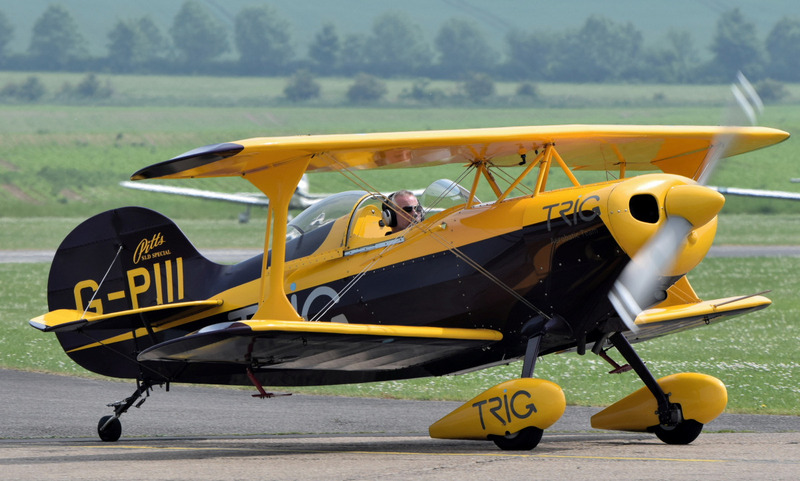 The pilots are Richard Grace, son of the famous display pilots Carolyn and Nick Grace and Dave Puleston. 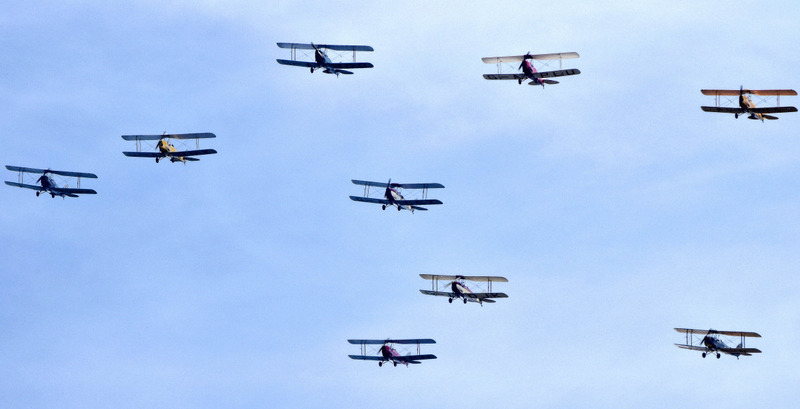 The Tiger 9 Formation Team display in nine de Havilland DH.82 Tiger Moth aircraft in close formation. 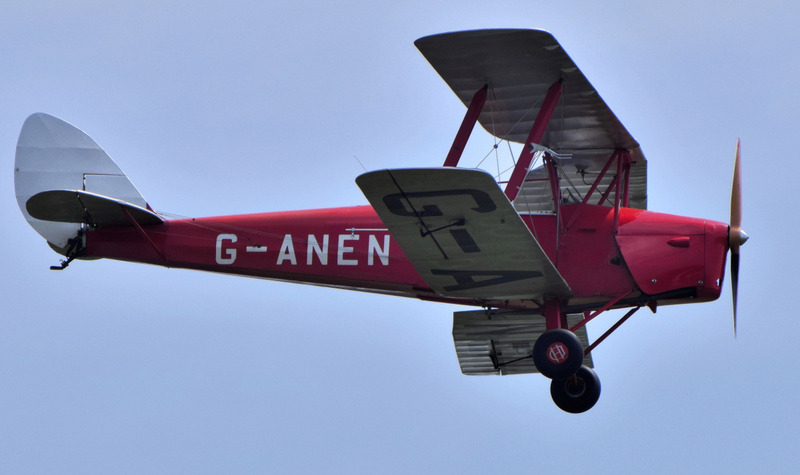 The Tiger Moth was operated by the RAF and others as a primary trainer in the 1930s and remained in service until the 1950s. 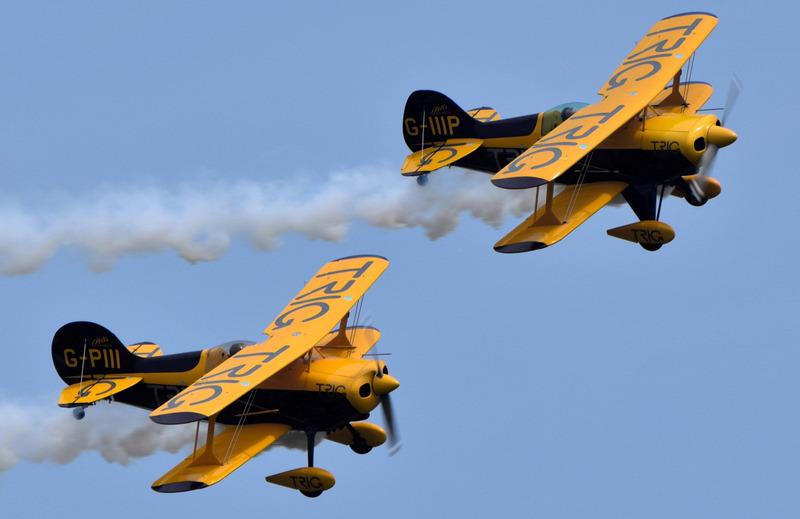 Keeping in close formation with these old biplanes can be very tricky, especially in windy conditions. 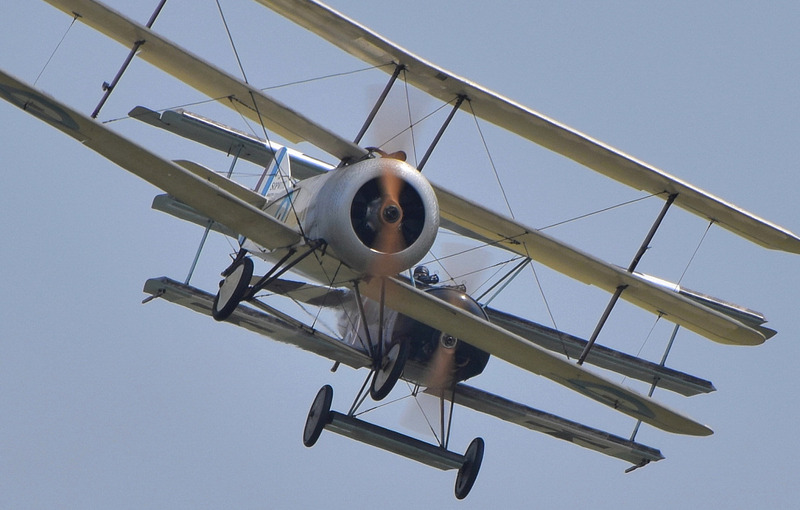 It was good to see the Great War Display Team again at Duxford, with their WW1 replica aircraft, simulating dogfights, bombing and strafing using pyrotechnics. 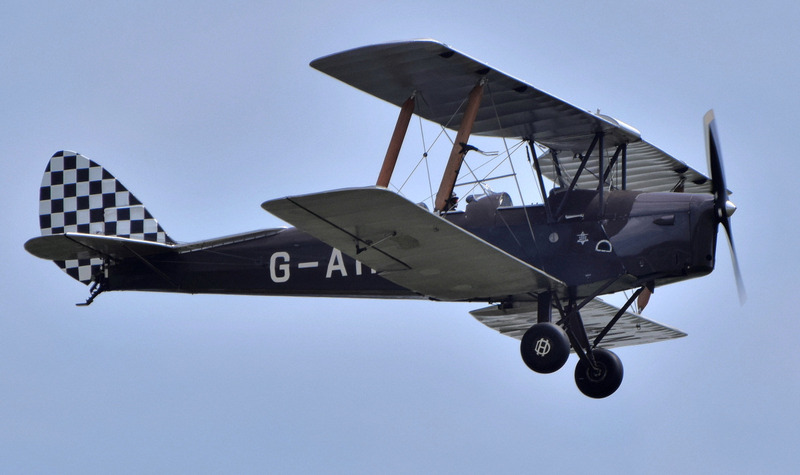 The aircraft included: two Fokker Dr.Is, a Junkers CL1, three Royal Aircraft Factory SE5as, a Royal Aircraft Factory BE2c, a Sopwith Triplane and their latest addition, the Avro 504K. 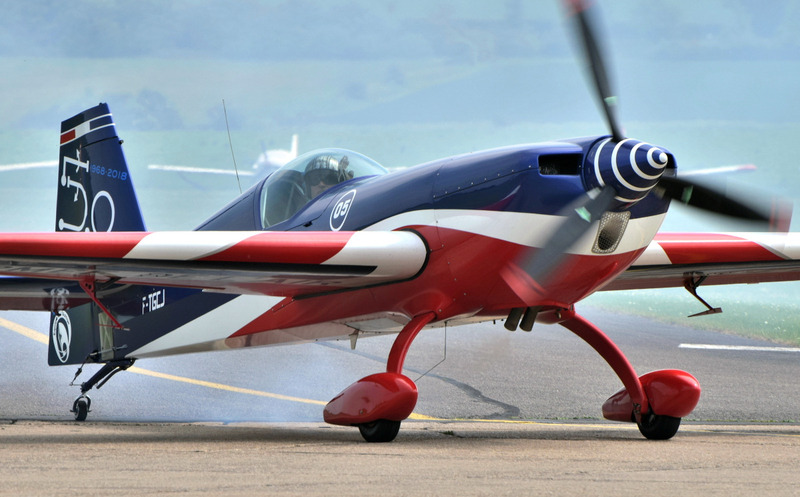 The Global Stars Team are a team of British aerobatic champions, past and present, flying air shows all over the world. 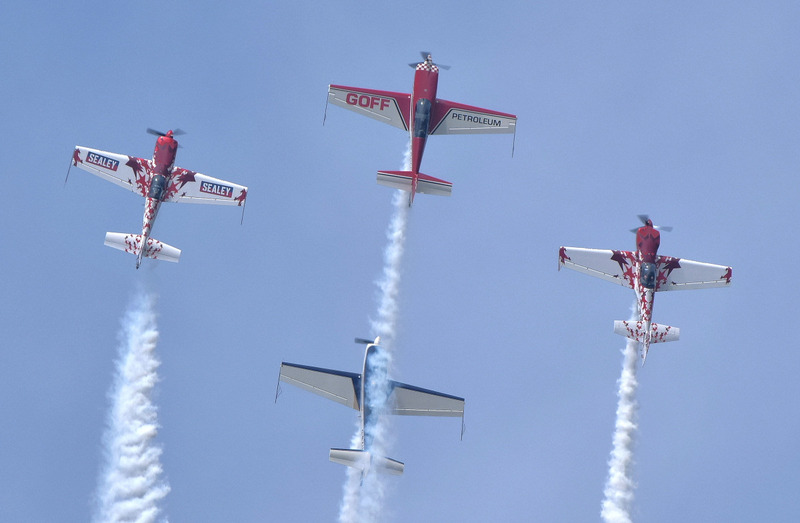 The team consists of several types of aerobatic aircraft including the CAP232, Extra 300S, Extra 300L and Extra 330SC and the aircraft carry the new 'dotty smoke' system, which can be synchronised between all four aircraft, and while it looks good, it also assists in stretching the duration of smoke available on each aircraft. 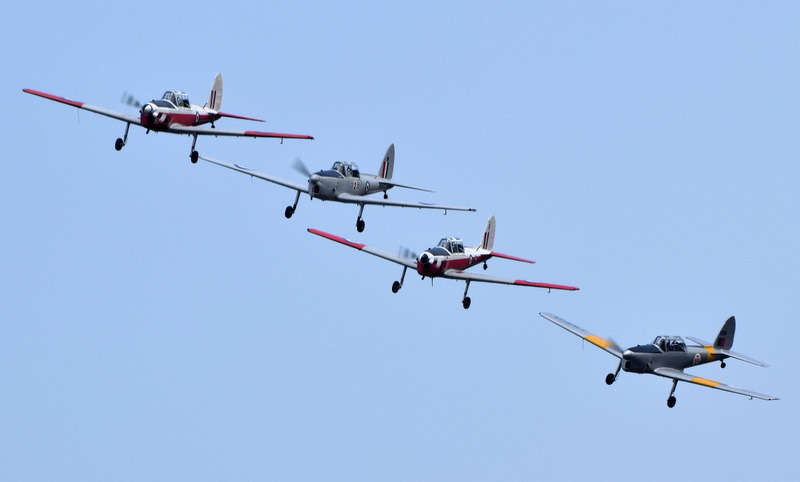 • Flying Legends Air Show - Saturday 14th - Sunday 15th July 2018. 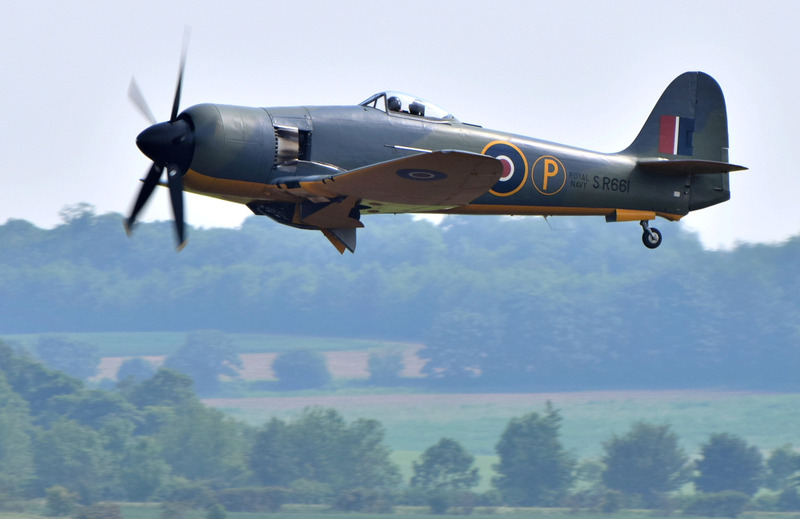 • Duxford Battle of Britain Air Show - Saturday 22nd - Sunday 23rd September 2018.